For over ten years, HRG has had a relationship with the Blood Center of Wisconsin. 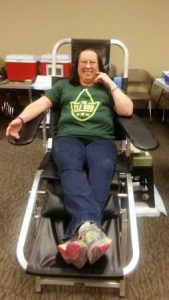 When I became chairman of the Wellness Committee a few years back, I made it a priority to set up recurring blood drives at our office every eight weeks. You might think it would be challenging to get our staff to participate, especially at this frequency but our employees know that donations such as these are the only way hospitals can obtain this life-saving resource. It takes only a half hour of an employee’s time, and most of our donors are very eager to donate blood. To recruit enough participants, it’s as simple as sending a few friendly reminder emails and posting a signup sheet. I’ll let you in on a little secret — I’ve also been known to run contests to encourage participation. For example, if we get 20 donors, then I raffle off a few casual day awards which allow recipients to dress casually on any day they choose. In addition to recruiting across our company, we also reach out to our neighboring businesses and encourage them to share the event details with their own employees. I am so glad to be part owner of a company where giving back is such an integral part of our culture. We may be a company of less than 60 employees, but we so freely give our time, our talents, our treasures, and even our blood!